So the day has finally come. The day when Matt loves golfing so much that he’s started to get his kid involved. Let me say this: the relationship between me and Matt’s obsession with golf is horrendous. 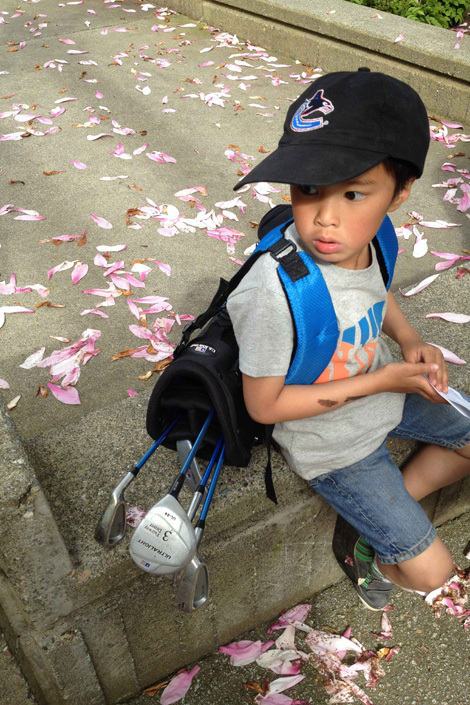 When he sleeps through most of the chaotic school mornings, he would wake up at 5am to go golfing. Of course golfing is more important that the fact that his children decide to go to school without wearing their damn pants. Now that Ethan is involved. And finally I was able to find ONE thing that makes me feel less hostile about golfing – his determination to take his own golf bag. That just reminds me how much energy I’ve exhausted over putting those hockey gears on him. Apparently he loves golfing more.